I'm happy to share another finish with you today! I made this sew together bag (pattern here) for my friend Emily as part of a Christmas swap between some good friends. 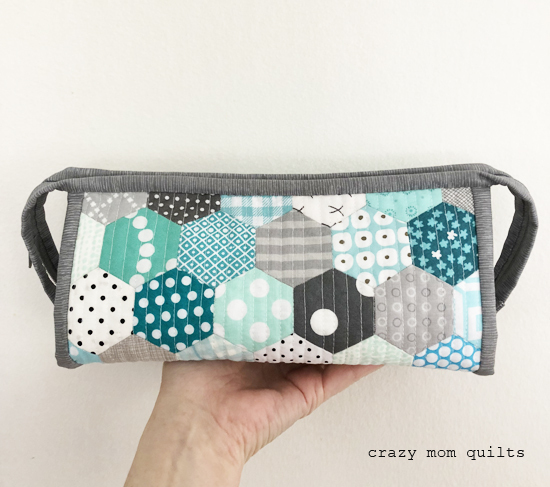 Emily likes gray, aqua and hexagons, so I combined all of those things in this little bag. I have to admit that this took a lot longer to make than I was anticipating, but she loves it, so it was totally worth it. The hexagons were English Paper Pieced, which means they were basted and then stitched together...all by hand. I did enjoy making the EPP panel and then using it for a bag exterior. I did not enjoy cutting through the hand stitches when I had to trim the panel down. That was nerve wracking! Thankfully I measured right the first time. This is the second time that I finished the binding by hand on a sew together bag and I'm sold on the neat and tidy results. 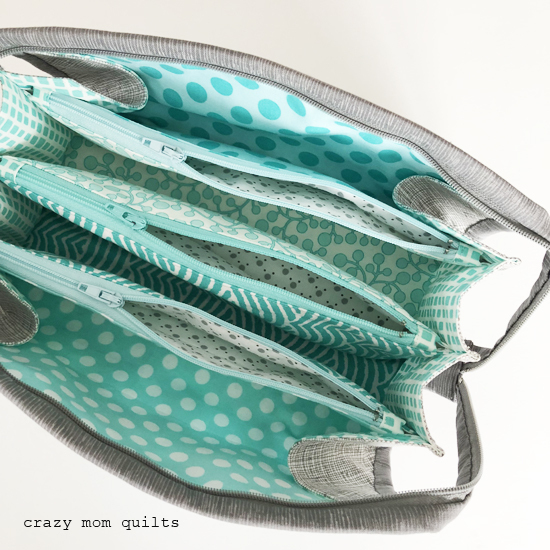 If you are attempting to sew this bag, I would highly recommend adding zipper tabs (see this post) as a modification to the pattern. It makes sewing up the sides so much easier. As you can see, I enjoyed selecting a lot of different fabrics for the interior. I have plenty of aqua in the stash to choose from. Hurray! This is my 7th sew together bag that I've made to date! I have one more to make before I put this pattern on hold again for awhile. They sure do make great gifts! As a little extra for the swap package, I made Emily this little coffee ornament. You can find the free pattern here. I used coffee beans for a filling, so it has a wonderful coffee aroma. I thought that was pretty fun. Well, that's it for me today! Do you have a finish to share? If so, please link up. Thank you for joining me for finish it up Friday! I hope you all have a Merry Christmas! That sew together bag is so cute!!! 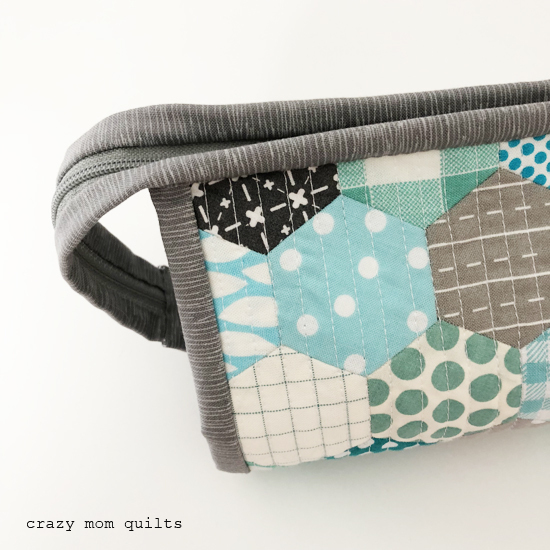 I love it done in the Hexie's :) That is on my list of "to make someday"
Beautiful little bag! I love the aqua. Lucky Emily! Merry Christmas! I am always inspired by your Sew Together bags. All of those zippers and binding had me intimidated, but I made my first one last summer. I hand stitched the binding down, and I felt kind of bad because I couldn't stitch it neatly enough on the machine. Now I know that you have issues with it too, I feel better about it! Merry Christmas and I thanks for all the inspiration I get from your blog. What a beautiful gift and extra for Emily! LOVE it! really cute! how long does one of those take you now? I think this is my MOST FAVORITE bag of this type!! LOVE the color and those sweet little hexagons, too. I have made quite a few of those bags myself. I think you have sold me on the idea of finishing the binding by hand. I found that it doesn't take much longer to make 3 or 4 than it does one because each step still takes a little thought, so it's better to just make several. LOL They are one of the best bags. You did a good job. Thanks for sharing. It’s ansolutely precious! I’ve made three...not sew sure I’d make another. 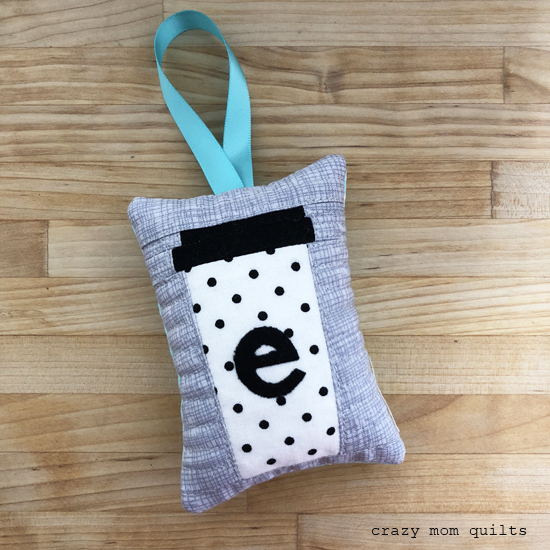 Emily will be so pleased to get this lovely bag and cute coffee ornament. They are both beautiful! Wishing you and your family a very Merry Christmas! Love the see together bag! Merry Christmas to you and your family. And I love reading your blog and seeing what you create. Reading your Finish it up Friday post is always a highlight of my week - and occasionally I have something to share on your linky too. Best wishes from New eEaland. I have two of these under my belt now. They are lovely to have and to give. Any lucky recipient you pass one of these to with love you forever! I just checked out the zipper tab tutorial - it's absolutely BRILLIANT! This technique gives such a professional finished look especially for the little amount of "extra" time it takes to go the extra mile. Can't wait to make another one just to try out the zipper tab technique...Thanks for the info!!! That bag is beautiful. I love all the pockets and organization options. I just bought a couple of patterns that I want to try but this could be on the short list. Any zipper improvement is a good technique to know. Your sew together bag is once again a total pretty! I just love it. This is a bag to treasure. It’s stunning. Thanks to you, I decided to make a Sew Together Bag for my friend, Karen. I customized hers with her initial. It turned out pretty cute, if I do say so myself. 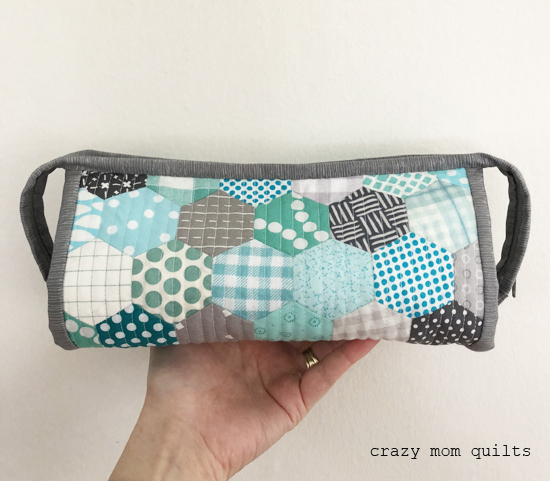 It was SO helpful to follow QuiltBarn's Sew Together Bag tutorials. The bag you made for your friend is adorable! Those hexies are perfectly trendy. You're a good friend to your friends.